Wahama senior Elizabeth Mullins throws a bounce pass into the paint area during the second half of a Dec. 14 TVC Hocking girls basketball contest against Southern in Mason, W.Va.
MASON, W.Va. — The streak is finally over. 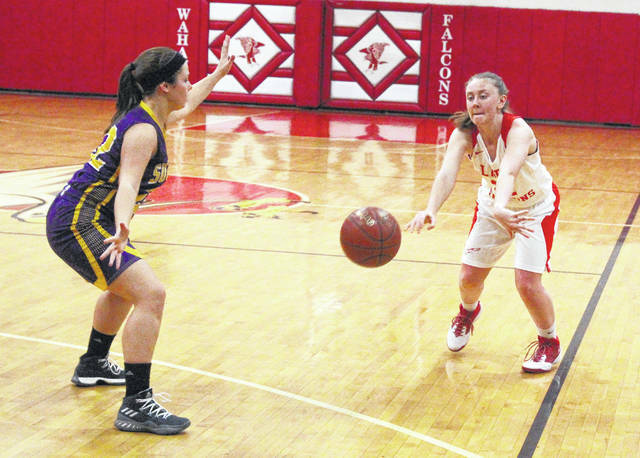 The Wahama girls basketball team snapped an almost five-year-long league losing skid on Thursday night following a 40-28 victory over visiting Trimble in a Tri-Valley Conference Hocking Division contest at Gary Clark Court in Mason County. The Lady Falcons (2-5, 1-5 TVC Hocking) hadn’t enjoyed a league triumph since posting a 53-48 home win over Southern back on January 14, 2013 — a stretch that covered 74 TVC Hocking contests between then and Thursday night. The hosts, however, showed signs of real progress as the Red and White outscored the Lady Tomcats (1-6, 1-4) in each of the first three quarters while snapping an almost half-decade-long streak of misery. Freshman Emma Gibbs — who would have been a fourth-grader at the time the streak started — played a big role in ending the skid after producing a double-double effort of 18 points and 14 rebounds, both of which were game-highs. Gibbs scored four points in each of the first two quarters, then tacked on another eight points in the third canto that allowed the hosts to take a commanding 36-23 cushion into the finale. THS won the fourth quarter by a small 5-4 margin, but Wahama’s large cushion ultimately proved to be too much for the guests to overcome. The Lady Falcons built a 9-5 edge after eight minutes of play, then Hannah Rose chipped in seven second quarter points during a 15-7 surge that allowed the hosts to take a 24-12 advantage into the intermission. Wahama, behind eight points from Gibbs, made a slim 12-11 third quarter run to secure a 13-point cushion headed into the fourth. Afterwards, WHS coach John Arnott was very pleased to have such a colossal monkey off the program’s back. He also noted it’s a heck of a way to start the holiday season. “It’s a great Christmas present for a group of kids that have worked really hard,” Arnott said with a smile. “The girls have never quit through all of this and they never let the game get away from them tonight. They put the effort in tonight and they got the job done. The Lady Falcons made 18 total field goals — including two trifectas — and also went 2-of-4 at the free throw line for 50 percent. Rose followed Gibbs with 11 points and Harley Roush chipped in five points to the winning cause. Elizabeth Mullins, Victoria VanMatre and Gracie VanMeter completed the Lady Falcon tally with two points apiece. The Lady Tomcats netted 10 total field goals — including a trio of three-pointers — and also sank 5-of-10 charity tosses for 50 percent. Sydney Hardy and Kym Williams paced the guests with seven points apiece, followed by Skylar Moore with six markers. Breanna Brammer was next with five points, while Calen Campbell and Kaitlyn Spears completed the scoring with respective efforts of two points and one point. Wahama — which has now matched last year’s win total — returns to action Friday (Dec. 29) when it hosts Hannan as part of girls-boys varsity doubleheader. The girls contest will begin at 6 p.m.